We worked for 6 weeks straight and wrote something like 14 songs. He was at my house every day and we’d go to movies and get ice cream between sessions. My wife would make these amazing meals everyday and Seal was loving the food so much he’d serenade her while she cooked lunch. It was hilarious. He’s one of the most gifted singers I’ve ever worked with and his vocal range is really impressive. His writing is really special and once he trusts you musically he’s willing try anything. I appreciated being able to experiment and push him in new ways. He’s become close to my entire family and we just adore him. So you are a full time songwriter and producer and you manage full time too, Is that hard to juggle these roles and what is your background? For me, my background sort of set me up to have these kinds of skills. I started out playing in bands as a drummer and keyboard player through out high school and college. I fronted my own band for a minute. I toured in a band called Mayfair Laundry on Pamplin records in Nashville for a few years but never loved being in bands because of the politics. I loved being in the studio and writing songs and I was really involved in music at my home church in San Diego. I was randomly asked to be a music director/worship leader at a really fast growing church in LA that allowed me to be really creative. So for the next 15 years that was my focus. Each week I wrote a new song on whatever the pastor was speaking on so that gave me incredible insight on what moved people and what worked and what didn’t work. I led a creative team that wrote and planned dramatic sketches, arranged horn sections, string sections, video shoots, lighting designs, stage designs and I was over 300 paid and volunteer staff and oversaw a 7 figure budget for the arts department. Because it was LA, there we’re top session musicians and known recording artists on the teams. I built a home studio and produced tons of records during this time. It was a lot of pressure but it taught me so much. I quit all that 7 years ago to produce records and write songs. By this time, I had 4 kids all in private school and a mortgage so it was a serious risk. But it was a risk I was willing to take. I had been developing a band that was getting really serious about what they we’re doing so it was a very exciting time. So managing, writing and producing is something I’ve just always done. It helped me understand and navigate the business side, musical side and the people side to this business. I heard you’ve done a lot of composing for commercials too, is that true? What’s that like as opposed to writing songs with artists? Yeah, I’ve done a lot of that. I’ve done 15 commercials in the last 3 years from Victoria Beckham, Lamborghini, Guess, Southwest as well as the summer olympics campaign. It’s different because you’re working for an ad agency not an artist. And ad agencies have a difficult time explaining what they want. I remember a french agency I’d done a lot of work with for my biggest commercials kept saying in a french accent “I must have less plastic kind of sounds, more color”. That couldn’t be more vague and I ended up doing 79 versions of a Victoria Beckham spot and they ended up showing her only version #3 in the process and she loved it. So that means I did 76 more versions that I really needed too. Lol. All good. I don’t complain much and I’m stoked for the work. Writing with artists is the best for me as I’m in the room and there’s a real life connection and conversation going on. Congrats on your new publishing deal with Round Hill Music. How did you decide to sign with them? Josh Gruss and his team over there showed a lot of passion for what I am about. They are hustling opportunities and making really impressive moves all the time, so I love being part of that! I also just started my own publishing company called Cranberry Publishing where I’m signing writers and a few producers. What’s your favorite songs you’ve co-written thus far? Cool Kids by far. To see fans truly identify with this song has blown me away. You always hope to marry a good pop song with a message and I think we’ve done that! I also have a song called “Bet You Don’t Curse God” by Christina Grimmie that I’m really proud of. I’m excited for the world to hear Seal’s new record, he’s just taken it all to the next level. Trevor Horn killed the production so I’m proud to be part of this record. 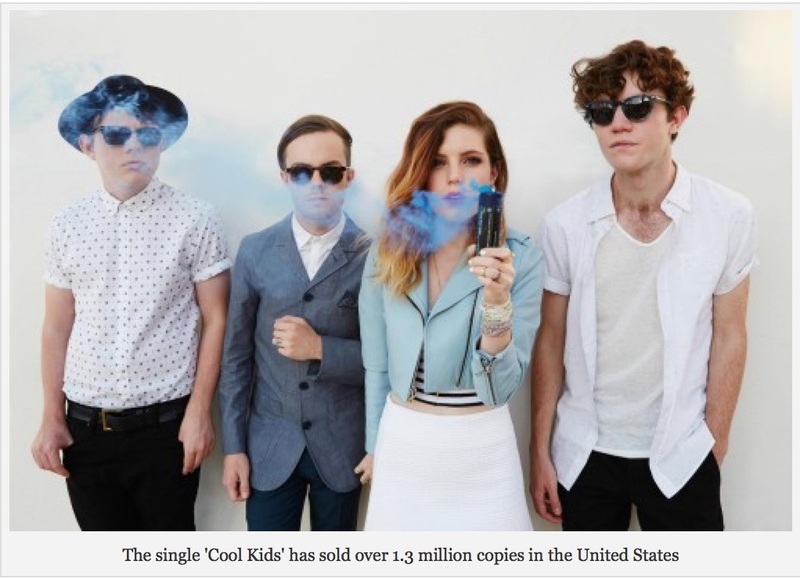 Congrats on the success of Echosmith. Are they the band you mentioned above? Are you surprised? Thank you, and yes they are the band I saw all the potential in world in these guys and girl. I’m not surprised, but I’m very grateful! I was really passionate and the band and I just wouldn’t stop working until we got somewhere. It was pure passion mixed with dedication, and love. This band has played something like 1500 shows thus far and they keep saying yes and showing up and killing it. Not one thing has come easy for this band but this kind of work ethic will always pay off when combined with great live shows and great songs. To put this in perspective, their first year on Warped Tour 2 years ago, when all the other bands were sleeping in after partying all night, this band was up @ 7am with our team putting up 150 posters every single day in every city, and spending 3 hours in the fan lines sharing their music, giving away stickers and cd’s and taking selfies with everyone. They did this in every single city and their shows went from 10-20 to eventually 400-600. They became the “band’s band” on that tour. On top that of they are some of the nicest human beings I’ve ever known. They have this special way of making people feel welcome immediately. It’s contagious. They are the kind of people that when they are doing a fan line they are not afraid to spend a little extra time with a fan that needs it. They will then go out of their way to do whatever they can to brighten that person’s day. It’s incredible. Not only did you co-write songs for Echosmith you are also the father to the band. How does that work? I make my living from being a songwriter and producer so it’s been natural that a collaboration would evolve on the writing side. When it’s time to put on the manager hat I actually say “hey I’m putting on my manager hat” and I advise them on my thoughts on a certain choice for their career. If I have a musical idea it’s never during one of those manager moments so these roles never collide. I approach them like I do any artist, I want to bring the best and most exciting ideas to the table that inspires a spark. I’ve been inviting them on projects their whole lives, I’ve used Jamie on guitar sessions since he was 16 and Noah’s first session on bass was at like 8 years old and I had Sydney singing solos at church starting at 2 years old. I used her on some cartoons I composed too. In the studio the flow is so natural and it’s just something we’re used to. I invited them on one of the Seal writing sessions and they killed it. Chemistry is so rare in writing teams and when you find it, it’s very special. As far as being a successful manager, What is your approach? Having vision and passion is everything! I have to cast vision every single day. When success starts to happen there are so many people and opportunities coming around and it’s so busy. It becomes very easy to forget why you are doing any of this. I can have 300+ emails coming in and if I’m not reminding myself and my team and even the band of what the mission is then it’s gonna be a grind and it’ll get old real quick. Also it’s about having passion in the small things and doing those consistently and how those feed into gigantic wins. One of my favorite books is by Malcolm Gladwell called “The Tipping Point”. It’s captures this really well. Every manager should check that book out. 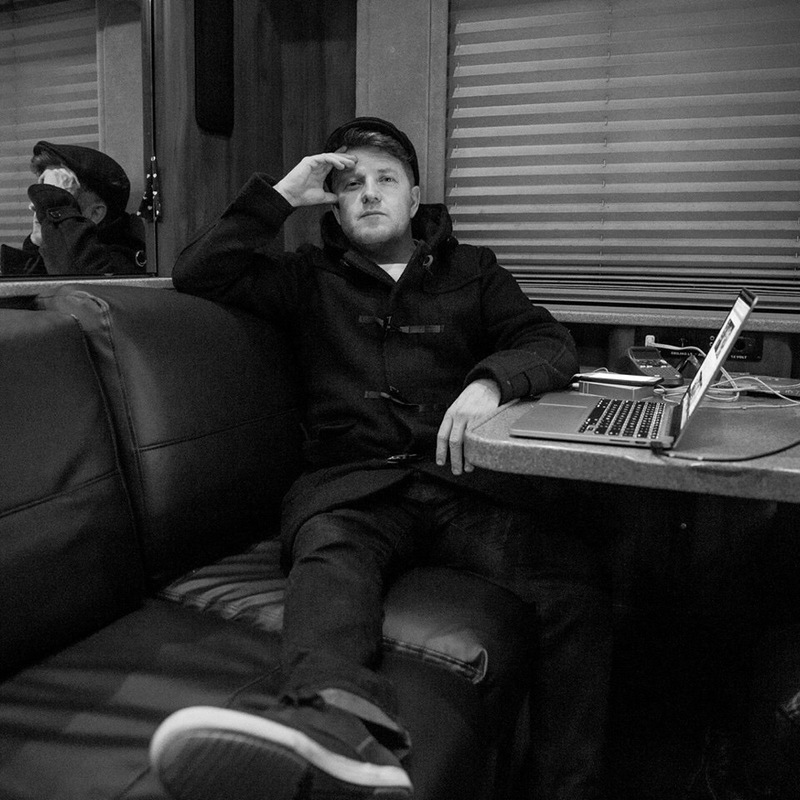 By far though my most important focus as a manager is managing the band’s perspective and perception in situations. To put this into a real life situation this is how I approach everything, let’s say there’s a a full day of promo in Germany with the band and the schedule is 8:00am – 8:00pm straight with press, radio visits, acoustic sets, phoners, recording radio ID’s etc. I don’t say to the band “hey we have a real tough day, we have 20 press interviews, 2 radio visits that are 45 minutes away, a meet and greet of a bunch of kids who don’t speak english and its gonna be really hot and you just gotta be tough cause this is your job and someone else wants your spot”. This is what I will say “Listen guys today’s a new day and it’s incredible to be in Germany, I loved our meal last night, didn’t you? Ok this is crazy but remember how you said you wanted to have an international career, well here we are across the planet in Hamburg, Germany of all places. How insane is that? So for today we have some of the biggest press and radio station movers and shakers in all of Europe on our schedule. I gotta be honest there’s a lot to cover but you have an opportunity to share your story and that story is going to be shared with over 2 million people. It’s a massive gift! We wanted people to simple care about what you’re about and now they really care. So let’s make today count…I’m here for you…ok?! Let’s go!”. When I approach life and business in this way it turns a “to do” list into a day, a week, a year and a life that’s filled with “purpose”. A plus to this kind management is that you also get as a “free bonus” people who are genuinely “grateful” as well. :). I think having an amazing team surrounding your artist is crucial too. Burt Goldstein is our business manager, Jeffrey Hasson at Paradigm as our agent and Glenn Davis is our attorney and together we make decisions. I lead this team, but any smart leader understands that you can’t know everything. I also have 2 guys I can call day or night for advice and that’s Rob Cavallo and Greg Latterman. These people are brilliant and I’m grateful to call them friends. Do you manage other artists? I’ve had a few other clients that I’ve more consulted with. I shopped Madilyn Bailey who just signed to Warner France and helping some other artists on that level but I don’t have time or the band width to take anyone else on full time. I’m writing everyday from wherever I am in the world so I have plenty to do. Music is going into streaming. Is it beneficial to the artists? I have a lot of songs cut with artists and the the checks for streaming are tiny. One of the songs I co-wrote has something like 175+ million streams and those checks are better, but not as amazing as you’d think. One cool thing about streaming is that unlike a real store with brick and mortar where your band’s record is on the front of a shelf for a week or two and then goes to the back and eventually not carried, at least with streaming it’s on the shelf of that virtual store forever. How can an artist build a long standing career? Write great songs, tour to grow your fan base, work hard every day and be grateful! What new artists do you enjoy listening today? James Bay, The National, Kwabs is amazing! What’s your approach with the label? First off I’m really appreciative of Warner Bros Records. Behind the corporation are passionate people who truly love music first. I couldn’t ask for a better partner than Warner for what this band wants to accomplish. My approach is to make it as easy as possible for the label to bring winning opportunities to the band. What I mean is we’re not a “needy’ or a “demanding” group of people, we make it fun and show up every time and work hard. If they do something that moves the needle than I don’t leave it to chance to show that we’re truly stoked they spent their time and resources on building this band’s future. We’ll send edible arrangements, balloons, gift cards etc to say “we love you guys”. Some managers have a very combative relationship with the labels, I choose to try and keep things moving in a positive direction, if there’s a problem then let’s talk about it and solve it. Are they any ventures outside of music you are involved in? I’m looking to open a small cafe with my wife. Somewhere her original recipes can come to life. She’s an incredible cook and overall creative person. My first priority is to help Echosmith finish this incredible record cycle in 2015 and I’ve got sessions coming up with a variety of artists like Cher Lloyd, Lights, Robin Schultz, Steve Aoki and Lindsey Stirling.